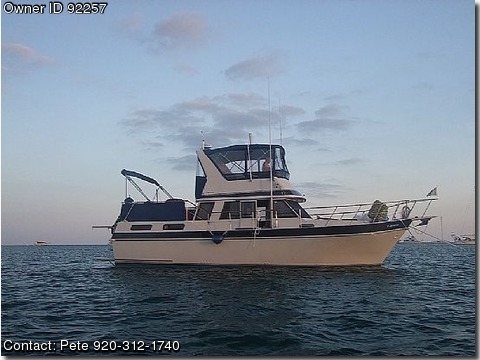 Call Boat owner Pete 920-312-1740. Basic Decription: Recent survey value 145,000. Excellent Condition 38'water line length. The boat has be updated so looks great and has been extensively refitted. The pictures are true to the look of the boat....not false advertising Lake Michigan boat until 2010 when she cruised to Florida. Galley has new quartz counter tops, new princess ceramic top stove, new stainless steel sink. Full guest head with separate shower and new Thedford silent flush head. V-Berth has an abundance of storage. The salon has new curtains, new carpet, reupholstered couch make for comfort, 32"LED TV, Jenson CDDVDXM FM stereo which has speakers in master stateroom. Master stateroom has 5 closets, and numerous drawers, quartz counters, separate shower with quartz counters, and granite sink. Aft deck is very large and great for entertaining. 100 gal fresh water, 40 gallons waste, and 360 gallons of fuel in 4 seperate tanks. Engines Cat 3208 TA, 3000 hrs. Generator 8KW Onan 400 hrs. 3 ACheat units stateroom, v berth and salon Electronics Garmin 3210 on upper helm Garmin 3206 lower helm, depth sonar,weather,XM DSC VHF Radios both helms Furno Radar Com Nav auto pilot system Xantrex prosine 2000 inverter charger Xantrex truecharge 40 amp chargerhouse bank Pro mariner 20 amp charger for start batteries Bilge watch bilge counter Blue Seas automatic charging relays Deck Maxwell windless with chain counter 40lb,plow anchor 180' 38 chain,30 lb danforth. 500 lb davit on stern New custom extra wide swim platform All new canvas in 20092010, incl.mooring cover Full walk around side deck Engine Room New 11 gal SSwater heater, rachor fuel filters with vacuum gauges, fireboy automatic fire supression system. All systems are functional, all new wiring to meet current standards, and no mystery wires Thru hulls replaced with marlon ball valves. This boat is 100 ready to cruise or live aboard and the biggest 38' you will ever see Great Looper boat.